CERN has successfully tested "crab cavities" to rotate a beam of protons – a world first. 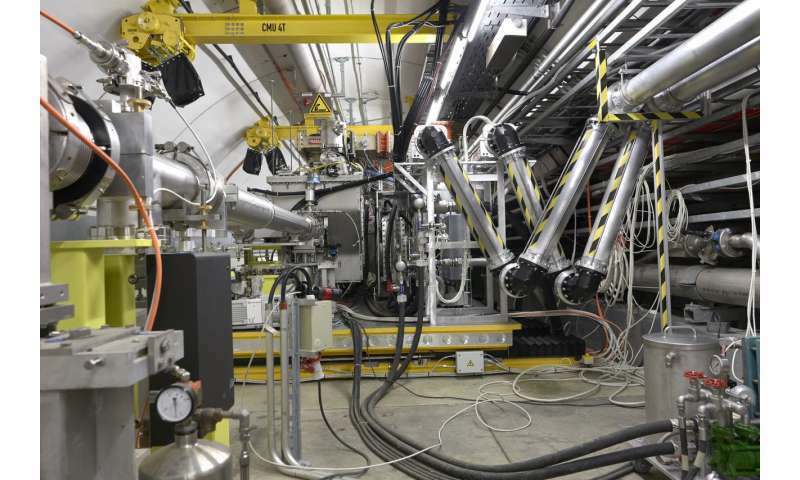 The test took place on 23 May using a beam from CERN's Super Proton Synchrotron (SPS) accelerator and showed that bunches of protons could be tilted using these superconducting transverse radiofrequency cavities. These cavities are a key component of the High-Luminosity Large Hadron Collider (HL-LHC), the future upgrade of the LHC. The HL-LHC, which will be commissioned after 2025, will increase the luminosity of the LHC by a factor of five to ten. Luminosity is a crucial indicator of a collider's performance: it gives the number of potential collisions per surface unit over a given period of time. In other words, the higher the luminosity, the higher the number of collisions and the more data the experiments can gather. This will allow researchers to observe rare processes that occur beyond the LHC's present sensitivity level. Physicists will also be able to perform precise studies of the new particles observed at the LHC, such as the Higgs boson. The newly developed crab cavities will play an important role to increase the luminosity. In the LHC, the two counter-rotating beams are not a continuous stream of particles but are made up of "bunches" of protons a few centimetres long, each containing billions of protons. These bunches meet at a small angle at each collision point of the experiments. When installed at each side of the ATLAS and CMS experiments, the crab cavities will "tilt" bunches of protons in each beam to maximise their overlap at the collision point. Тhis way every proton in the bunch will be forced to pass through the whole length of the opposite bunch, increasing the probability of collisions and hence more luminosity. After being tilted, the motion of the proton bunches appears to be sideways – just like a crab. Crab cavities were already used in the KEKB collider in Japan for electrons and positrons, but never with protons, which are more massive and at significantly higher energies. "The crab cavities are expected to increase the overall luminosity by 15 to 20%," explains Rama Calaga, leader of the crab cavity project. The first beam tests on 23 May lasted for more than 5 hours at a temperature of 4.2 K with a single proton bunch accelerated to 26 GeV and containing between 20 and 80 billion protons, almost the intensity of the LHC bunches. The crab cavities were powered to about 10% of their nominal voltage. The "crabbing" was observed using a special monitor to observe the tilt along the length of the bunch. 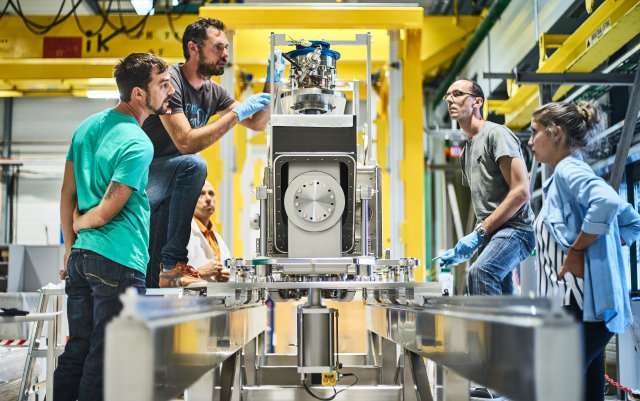 "These tests mark the start-up of a unique facility for testing superconducting cavities on a high-current, high-energy proton beam," explains Lucio Rossi, leader of the HL-LHC project. "The results are impressive and crucial to prove the feasibility of using such cavities for increasing the luminosity in the LHC."